As AnandTech highlights, MRAM is one of the fastest and highest-endurance nonvolatile memory technologies on the market but density is severely limited compared to NAND flash memory or even Intel’s 3D XPoint memory. A partnership with GlobalFoundries to make MRAM on their 22nm FD-SOI process, however, is allowing MRAM chip supplier Everspin to push capacities to new heights. Currently, the supplier is churning out 256Mb chips although they’ll be sampling 1Gb chips by the end of the year. IBM’s FlashSystem appliances have used custom form factor SSDs and a system-wide power loss protection design, AnandTech notes, along with FPGA-based controllers. With their new system, the company is switching to a standard 2.5-inch U.2 drive form factor. This means they have to implement power loss protection at a per-drive level and it was impractical to use supercaps to keep the FPGA controller running long enough to flush their DRAM write caches. MRAM’s nonvolatile nature, however, eliminates the need for bulky supercaps. 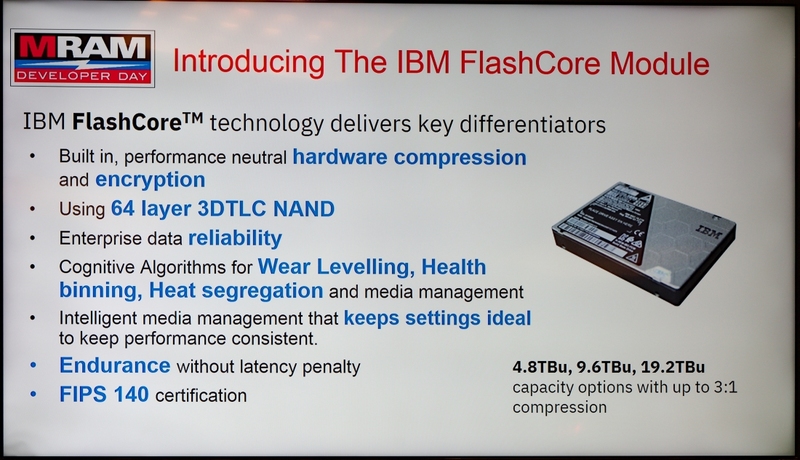 According to Anand, the new SSDs for IBM’s FlashSystem have a usable capacity of up to 19.2TB of 64L 3D TLC NAND. They use a 20-channel NAND interface and a four-lane PCIe 4.0 host interface that can operate in dual-port 2+2 mode. IBM’s new FlashSystem drives are on display at the Flash Memory Summit this week and will be shipping to customers later this month.